A headed goal in 5-a-side is always a bit of a collector’s item, but when it’s scored by a dog – that’s got to be worth writing about! To set the scene, somewhere deep in Argentina an eagerly contested game of 5-a-side is taking place. The shoddy preparation of the two teams belies the occasion, with neither side appearing to have put any effort whatsoever into trying to match the colors of their shirts or even fetch some bibs. Still, that hasn’t bothered the locals who have turned up in numbers, with a tv crew too for some reason! Quite why there’s a camera crew and small crowd gathered isn’t immediately apparent to the unsuspecting viewer. However, in a matter of seconds it’s about to become very obvious indeed. See, we’re all about to witness something special – Argentina’s latest hot footballing property, perhaps even the birth of a new global football star. As the winger in the unidentified yellow-striped shirt dribbles down the left on his way to goal, he looks up about to pick his spot at goal for the shot, but then out of the corner of his eye he sees support arriving at the far post begging for the cross. After a quick double-take he realises that the support is, in fact, in the shape of a dog. Yes, a DOG! Unselfishly he crosses it and the dog nonchalantly glances it in off his head at the back post, sending the crowd into raptures and, at the same time, announcing his arrival onto the world stage – wheeling away in celebration. Fantastically, the defenders look genuinely flummoxed that none of them had managed to pick up the dog, with the defender in the white shirt pointing at the dog and uttering what can only be assumed to be some accusing words that his teammates should have been marking the canine danger-man, … er danger-dog. Whatever will happen next!? A dog scoring a goal – and with a lot more composure than the majority of players we see gracing our local pitches! Not only is it incredible, but it also gives us all the chance to wheel out some diabolical dog-based puns. 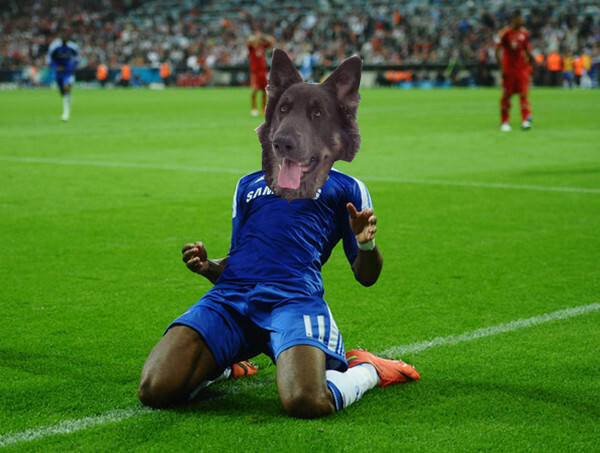 Information is sketchy on the dog, but clearly from the understated celebration, he’s no stranger to scoring goals. From the country that brought us Maradona and Messi, there is genuine excitement at the moment that the Argentinians might have unearthed yet another gem with this particular dog, and no doubt the big European teams will be running the rule over this mutt in the next few weeks. If he can keep producing this sort of form and banging in the goals, then he might get that big move he’s always dreamed about. Rumor has it that a couple of English teams have already expressed an interest in taking the dog on trial. Naturally, he’s been linked with Huddersfield (‘the Terriers’) and Wolves but it is understood, however, that the player may end up at lower-league Dogenham and Redbridge (yes folks, the puns are going to get even worse than this…). As a relative newcomer to the game, he’s finding his best position, with coaches being unsure of whether his raw talent is better suited to attack, emulating top strikers such as Robbie Growler, or as a defender in the mold of Yapp Staam. Time will tell, although if it keeps scoring impressive headed goals of this sort then it’s inevitable that comparisons will be made with Didier Dogba. For what’s it’s worth, it’s understood that the dog’s favorite player is Wilfred Bony of Swansea (that’s probably a pun too far there). Got any comments on the dog? Reckon he’d outscore your team’s striker? Think you can suggest an even worse pun than the ones we’ve come up with above? Leave your comments below!